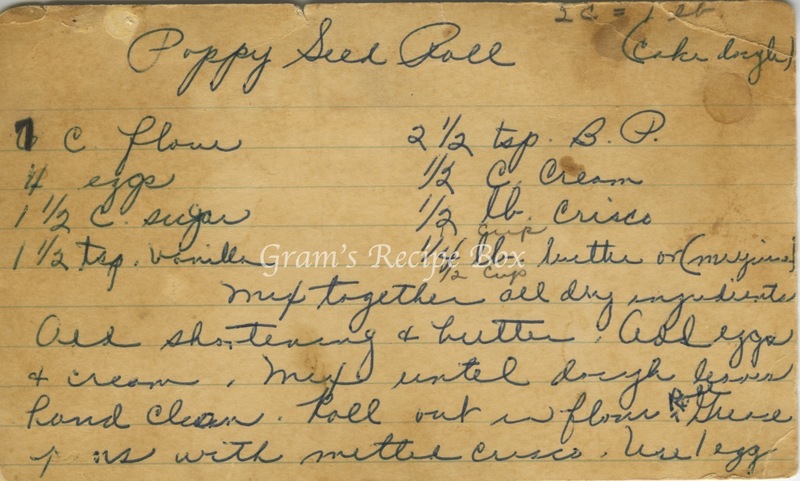 Here’s a yellowed with age recipe card that has clearly been used numerous times. As I scanned it, that wrinkled part in the top right corner broke off in my hand! 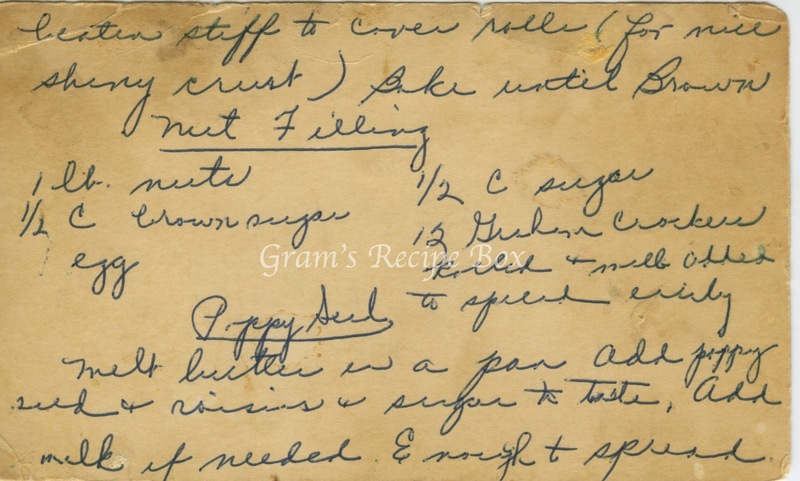 Such is the case with old recipes, so I am glad I have this scanned and preserved for everyone to enjoy. There were a couple notes penciled in on the recipe that are unclear as to what they mean. 1 cup of what? 1/2 cup instead of 1/4 lb? 2 1/2 tsp B. P.
Mix together all dry ingredients. Add shortening & butter. Add eggs & cream. Mix until dough leaves hand clean. Roll out in flour & pull? Grease pans with melted Crisco. Use 1 egg beaten stiff to cover rolls (for nice shiny crust). Bake until brown. Melt butter in a pan. Add poppy seed & raisins and sugar to taste. Add milk if needed. Enough to spread. It looks to me like she increased the amount of flour from 6 cups to 7. Then as to the butter (fat) 1/4 lb. = 1/2 cup, doesn’t it. I agree, and this of course is where the cook’s own knowledge of the recipe is so valuable! She knew exactly what she was doing, I’m certain.